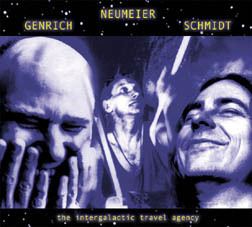 Genrich- Nuermeier and Schmidt - "The Intergalactic Travel Agency"
This is the second release of improvised material released by the Sunhair label of the Guru Guru members (Genrich and Nuermeier) with Dave Schmidt (Sula Basana, Zone Six). The material was compiled from live concerts they played in 2004 and 2005. The CD begins with a very slow spaced out number called "Intergalactic" that lasts 23 minutes. It slowly builds up around 10 minutes with Genrich kicking in with some wah guitar before the jam really takes off.. He is still a master of some cool spaced out guitar when he wants to. The track spaces out at about 18 minutes and goes back to an ambient thing. "Beyond Acapulco" is another 15 minute trip that is quite repetitive like CAN and built on some looped guitar and/or bass. "Gofinger" is a very jazzy 8 minute piece showing Genrich having a little work out. "Urug" is a totally experimental piece of music. "LSD and Uschj nerke" ends the CD (21 minutes). Like the first piece, it is spaced out sounds for the first 8 or so minutes before the guitar and drums really kick in and a groove starts. At the end of this track the whole band is really taking off and jamming hard. Cool psych rock! This is a band that still really captures the experimental music feeling of the early Krautrock years. Check it out if you like this stuff. For more information you can visit: http://www.psychedelic-network.de.